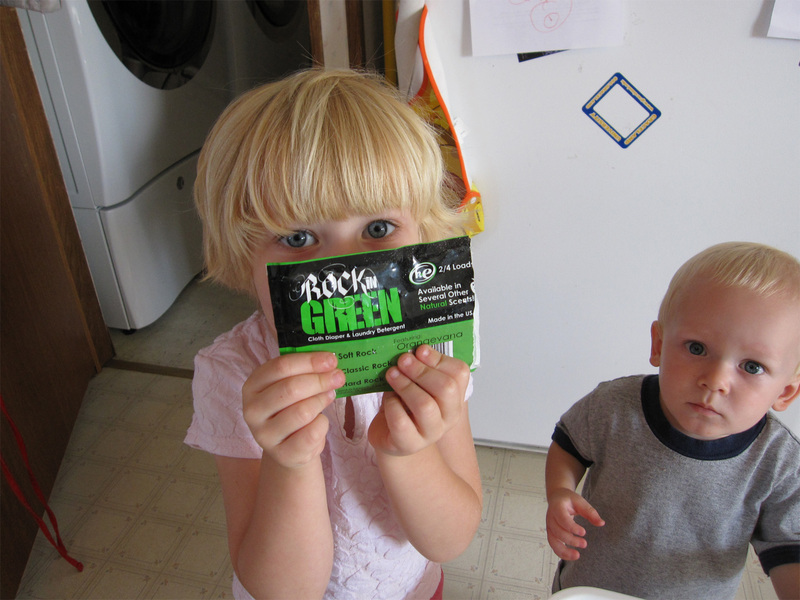 As I mentioned, I got samples of Rockin' Green detergent in Hard Rock, in all the scents. So far, I've opened Orangevana, Smashing Watermelons, and The Plain Green Tea's. (Did I mention I love the names?) I had thought that the scents would be a lot stronger than they were. Really, it's just a hint of scent, and only when I'm opening the bag. I can barely smell it once I start running the water into the soaking container, so I would speculate that when I use it for regular washing, that I wouldn't notice much. That's not a bad thing, in that it doesn't leave potentially irritating scents in the diapers. 1) Rocked a soak in the diaper pail. I have taken pictures to document this, but unfortunately, there's nothing really outstanding about the photos to post. Nothing like some of the photos I've seen, where the water turns black! (But, that's usually with things like men's grody work clothes, or dark colored towels) I'll go ahead and post the photos later. My helpers with the first soak. 2) (Attempted) to rock a soak in the front loader. I don't know that it really worked as intended, though, because most of the diapers were not submerged in the water. Silly low water usage device. 3) Rocked a soak in a 5 gallon bucket. I have one, maybe two soaks left to do before all the diapers currently in rotation are washed. (Do I really have THAT many diapers?! I need to do a stash count!) That doesn't include all the newborn/small diapers that are currently in storage. Since my bath tub doesn't keep a good seal at the drain, and the bath tub that does is the one that is not in a kid-safe zone (N has more than once tipped over the edge of the tub while trying to retrieve something of interest to him), I've been doing the diapers in small batches (24 or fewer diapering items per soak). 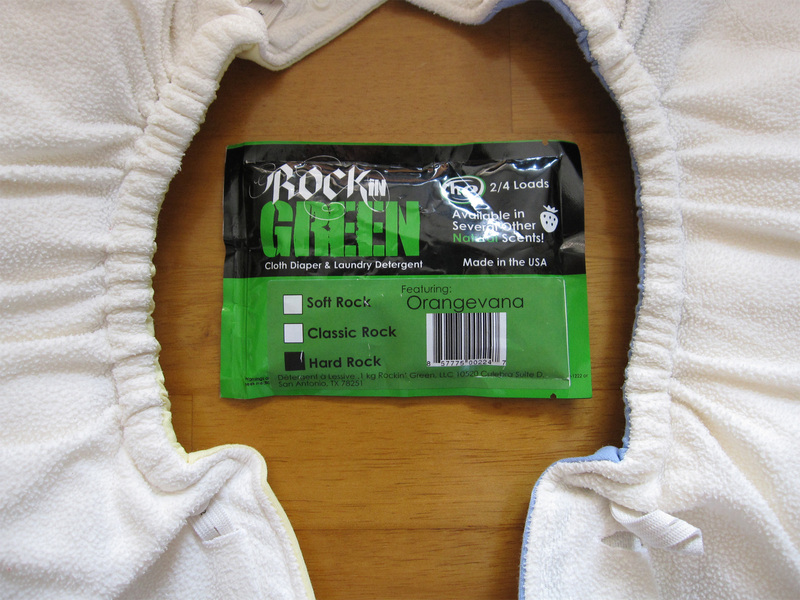 Also, a tub soak would use more rockin' green that I have in any one scent, and I wanted to be able to fully experience each scent. I have noticed that it seems like it takes fewer rinses than other detergents I've used to get the bubbles out. Since I'm not washing the diapers yet in the regular method, I'm not in a place to really compare. However, considering that the process for soaking the diapers uses 3 tablespoons of detergent, and a regular wash uses just one, I'm guessing that it really will take fewer rinses. Yay! The diapers have come out of the washer and dryer/clothes line smelling clean. 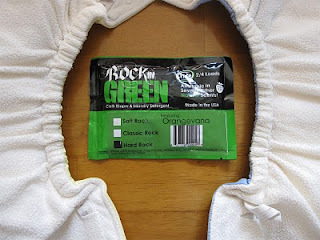 My perfectionist self is trying to keep all the Rockin' Greened diapers separate from the others, so I can really tell a difference in terms of what keeps stinking and what doesn't. Even though I started my Rockin Green experiment several days ago, I just put N in a diaper that's been washed in the detergent two nights ago. The smell in the morning? None! I'm looking forward to seeing how the rest of the diapers turn out!